Typical engine data sensor and control component locations on the GM 3.8L 3800 v6 engine. Exact location may vary depending on vehicle year / make / model. Click on a number for a description of the component. A few related auto repair questions and answers. 2003 pontiac grand prix computer trouble code p0128. 1999 Buick regal has OBD2 code p0341 cam sensor signal error. 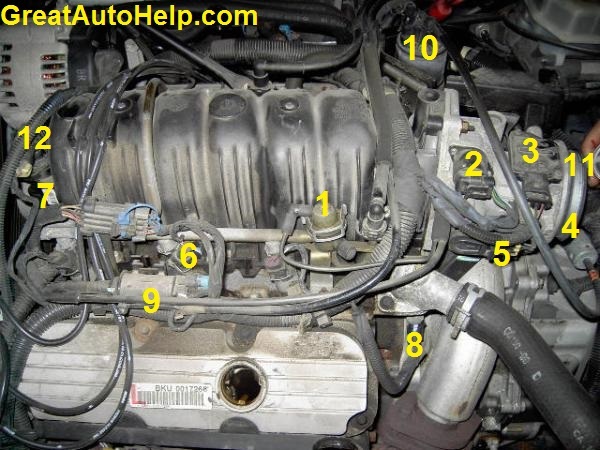 1999 Buick Park Avenue check engine light. where is the vehicle speed sensor. viewed from under the car. where is the map sensor on this 3800 GM v6? the manifold, and the PCV is inside. where is the DPFE sensor? where's the PCV valve located on a 3800 supercharged engine? Where is the Ambient Air Temperature sensor located at? on make, model, and year vehicle. where is the cam shaft position sensor at. Where is the crank sensor located at. to get to the sensor. instrument panel cluster (gauges) problem. got had just two terminals, while the old plug has three receptacles. and another for the computer. Where are the air bag sensor location(s)? referring to, and what make, model and year. to get the connector you need. where is the modification switch on 95 olds. 88 3.8L. name you are asking about. suction when removing oil cap... Replace PCV valve and seal and spring..
past the MAF sensor and on the throttle body. start anymore. What should my absolute TPS % be without engine running? pulling on them to see if one breaks.